The members of Venice film festival jury, pose for photographers in front of Cinema Palace in Venice, August 30, 2000. 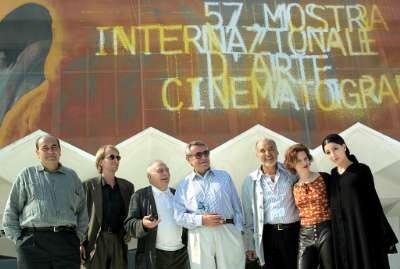 From left to right, director Giuseppe Bertolucci, actor Andreas Kilb, director Claude Chabrol, director and President of jury Milos Forman, writer Tahar Ben Jeullon, actress Jennifer Jason-Leigh and director Samira Makhalbaf. The jury will preside over the 57th edition of the Venice film festival, the oldest in the world.